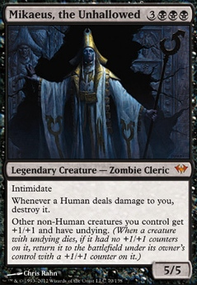 What happens to indestructible creatures with -1/-1 counters putting it into the negative? 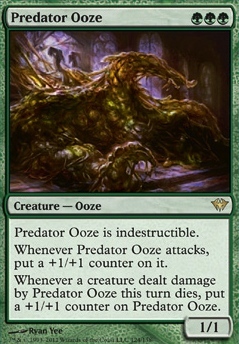 Skoodly Predator Ooze is definitely great sticky devotion, but its ability isnt all the relevant. Depending on how many removal heavy decks we are coming across is could come in handy. vortexgrey thanks for all the suggestions, sadly I havent had a chance to play much with this deck lately but I will definitely play around with Kiora, Master of the Depths as well as Fertile Ground . Burning-Tree Emissary can be clunky but is does add a lot of explosive potential and if nothing else gives us essentially free 2 devotion. That being said, usually if we lose game one that is what we end up taking out to be able to side in what we need. squonk76 Oh yes! 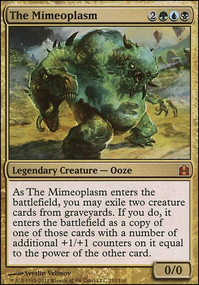 Put in a couple of Experiment One, Hardened Scales, Scavenging Ooze, Corpsejack Menace, Winding Constrictor together with the real MVP Predator Ooze and some Rancors and you have excellent Ooze deck ready to play! Some removal might be necessary as well :P Let's hope Simic invents some new eeze in the next set! Love this deck... Thantis was a really cool card and I think this type of deck is the best way to play him. Well "good" is a subjective term more so than an objective one, despite what most people would assume. 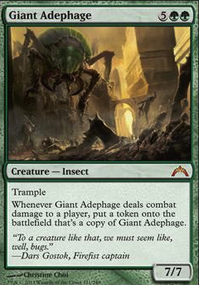 For example, Gifted Aetherborn, I think we can all agree is a fantastic card and it saw tons and tons of play. Meanwhile, for additional cost, Vampire Nighthawk adds on Flying, and she sees next to no play outside of Commander. Evident by the fact she is literally 1/4th of the price - meaning she has 1/4th of the demand. I would argue that for , that Flying is well worth it and this makes her a GREAT card, despite what the general community suggests. Even if people AGREE she's a good card, that doesn't change the fact she is seldom run in anything. 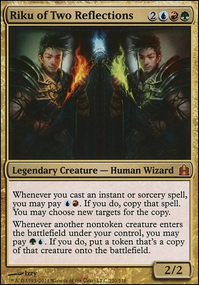 The same could be said about something like Steel Leaf Champion who for the same exact CMC and colors is strictly better than Leatherback Baloth, both of whom are not nearly as powerful as the same CMC and colors of Predator Ooze. Likewise, Lava Spike is strictly worse than Lightning Bolt as you can not target as wide of a scale of threats. Midrange decks won't touch Lava Spike because it is not flexible enough for the boardstate. Burn decks who aim to win by T4 will thrive with 4x Lava Spike on top of 4x Lightning Bolt because it doubles your resources to win the game as fast as possible. So, really "good" becomes just as subjective of a term as it is objective. It depends on not only the deck / meta / format you wish to play in, but also what it brings to the table (Literally) when compared to other cards of the same power level or casting cost. Having said all of this, a card I truly admire and hold close to my heart is Savage Beating. As an aggro-midrange Timmy, I LOVE the idea of getting extra combat phases and dealing tons and tons of damage. Breaking through with an indomitable force always makes me giggle with glee. But the casting cost + entwine is a hard bargain. So I'll give it a push to help it out. Play Savage Beating only during combat and only before attackers are declared. After this phase, untap all creatures you control. They gain haste. There is an additional combat phase. 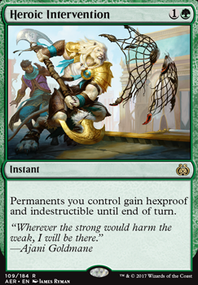 What this does is it allows the full potential of the card to blow up two turns earlier by sacrificing three lands you tapped for it's cost. If you can manage to blow out on T5, it's well worth the cost. It turns it from a late-game Timmy card to a mid-game Johnny card and I feel like this is sufficient enough to meet the challenge's requirements. Same challenge. Take a good card and push it to become better. 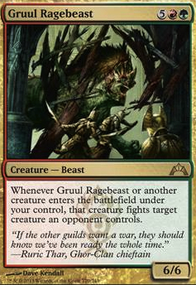 MurrSheep I too run a Rakdos Minotaur deck that features Mogis. For a bit I also included Angrath, for the memes. I eventually took him out as he actually slowed down the aggression of the deck. Minotaur are still my #1 favorite Tribe in all of MTG, with Dragons and Knights at #2, and Warriors (Though they are kind of lackluster), Zombies, and Vampires at #3. Equipped creature has haste and first strike. , : Nar-Ra, Spear of Passion and Rage deals X damage to any target. Activate this only if it is equipped on a creature. There are few worthy enough to brandish a weapon of the gods for fear of it being used against them. However, in rare exceptions, that fear is well worth the risk. 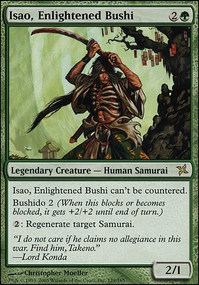 Same challenge: Make a Legendary card of any type that has good synergy for one of your favorite Legendary Creatures.